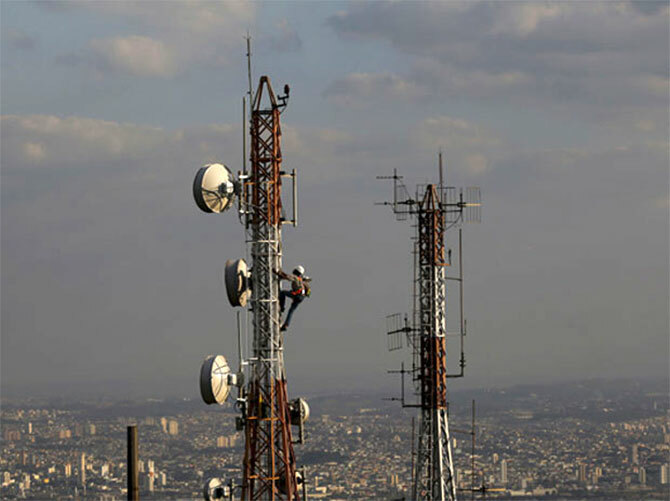 Rediff.com » Business » The great Indian debate: Do mobile towers really cause cancer? The great Indian debate: Do mobile towers really cause cancer? Mobile tower radiation reaching us is more than a thousand times weaker than that from the handsets we use and the Indian standards are 10 times more stringent than the global norms recommended by the World Health Organisation, points out T V Ramachandran. These days, frequent are the controversies due to “fake news” in diverse fields. Away from the limelight of these debates, a governmental campaign has been working to demolish misinformation and inadequate information in a vital area impacting Digital India, viz, the electromagnetic field (EMF) emissions from mobile towers, commonly referred to as “mobile tower radiation”. The Odyssey of Greek lore lasted 10 years. So it is with the Indian EMF odyssey, which started 10 years ago with the first appearance of media reports on adverse EMF perceptions fuelled by inadequate information and vested interests. Regrettably, no concerted official action to counter these adverse perceptions was undertaken for years. However, an education movement to improve public awareness of the scientific truths and authenticated facts about mobile tower EMF radiation is now being rolled out by the Department of Telecommunications (DoT). In the first phase, two-day workshops were conducted in six state capitals - Dehradun, Hyderabad, Mumbai, Chandigarh, Jaipur and Guwahati - over six months, led by the DoT secretary, with presentations by him and his team of senior officers and experts, doctors and medical experts, scientists and academic experts from the Indian Institutes of Technology and reputed institutions. Every event was attended and supported by the chief secretary of that state, and in some cases like Chandigarh and Guwahati, even by the chief secretaries of adjacent states. Minister of State (Independent Charge) for Communications Manoj Sinha presided over the workshop in Jaipur, the epicentre of mobile tower EMF-related issues several years ago. The high point of each of these workshops is the one-hour open Q&A session after the expert presentations. In this, an array of experts (usually nine or 10) form a panel on the dais and questions from the audience on policy, technical, medical, standards or compliance issues are welcomed and responded to. Positive and enthusiastic feedback from the audience - “Why were such workshops not done earlier?”, “We urge the government to provide us more towers urgently for improved connectivity”, “You must carry these useful programmes to other locations in the state” etc - show the effectiveness of these sessions. Government-prepared, crisp and easy-to-read leaflets providing tower EMF-related authenticated information were also distributed to all attendees (on average 250) at these events. The attendees included state government officers, municipal commissioners and councillors, members of resident welfare associations, tower site landlords, doctors, academicians and industry representatives. The participation of the chief secretary and his senior officers concerned conveyed strong messages of support for the creation of more mobile tower infrastructure to enable the realisation of the vision of Digital India for which good mobile connectivity is necessary. For example, in Jaipur where Sinha presided, VIPs who participated included Rajasthan Industry Minister Rajpal Singh Shekhawat, Member of Parliament Ram Charan Bohra, Jaipur Mayor Ashok Lahoti and the chief secretary all spoke unequivocally of the need to shed concerns arising from false and incorrect information and to go forward to create the direly-needed digital infrastructure of mobile towers. Having completed phase 1 of the campaign by January-end, DoT launched phase 2 smaller format workshops led by the deputy director general, TERM (Telecom Enforcement, Resource and Monitoring), in various cities and towns of states in February. It started with workshops in Udaipur, Shillong, Jorhat and Hyderabad. Several workshops every month are scheduled to take place over the next 12 months. While DoT is conducting its intense and sustained campaign, other agencies have also contributed. It was, in fact, the Telecom Regulatory Authority of India (TRAI) that kick-started the exercise, in 2015-end itself, with large-scale consumer awareness programmes in Bengaluru, Gurgaon, Pune and Kolkata to disseminate correct facts and scientific evidence regarding EMF emissions from mobile towers. These featured two-hour interactive sessions following a lead presentation by the TRAI expert officer. TRAI amplified these efforts with the distribution of leaflets giving correct information regarding mobile tower radiation as well as the placement of prominent advertisements on different aspects of mobile towers in English and five other major languages in about 54 publications across nine cities with a reach of over 24 million readers. The TRAI campaign continues in a smaller format through its regular consumer outreach programmes. The larger policy question: The above-mentioned initiatives of the government and the regulator represent outstanding efforts to interact with the public on a matter of great socio-economic importance for India. The bigger question is why they and other independent institutions have to conduct such expensive programmes on a defensive basis while scaremongers and parties with commercial interests continued spreading incorrect and misleading information about mobile towers. In fact, mobile tower radiation reaching us is more than a thousand times weaker than that from the handsets we use and the Indian standards are 10 times more stringent than the global norms recommended by the World Health Organisation. The cumulative damage to the country through gross domestic product loss due to inferior connectivity caused by insufficient number of towers could amount to several thousands of crores of rupees per annum. While honest doubts should be welcomed and addressed, punitive actions against vested interests, scaremongers and damage creators need to be seriously considered so that the digital progress of the nation is not stymied. T V Ramachandran is hon. fellow of IET (London) and president of Broadband India Forum. Views are personal.